In the 15th century, in order to procure gold and spices, a group of European adventurers, sailed out to strive for colonies on their sailboats; however, quite by accident, they were attacked by scurvy on their journey, and many of them lost their lives because of the scurvy. In 1593, there were more than 10,000 people died of scurvy in Britain; and four fifth of the Spanish and Portuguese sailors were also killed by scurvy. But, before or after these disasters, a miraculous event happened. In 1593, some French adventurers spent their winter time in Canada; among them, 110 people caught scurvy; the native Indians told them to drink water saturated with pine leaves and those who were suffering from scurvy did as they were told in desperation, and they all survived the scurvy luckily. From 1772 to 1775, when Captain Cook of Britain led his fleet to launch the second sail to the new world, in the process of crossing the Pacific Ocean, which took them 3 years, only one of his crew members died of scurvy in all his 118 crew members. The reason was that Captain Cook ordered his crew members to have pickled vegetables frequently, and this exempted his crewmembers from the attack of scurvy. The study and treatment on scurvy started from a British doctor, Mr. Linde, of the middle 18th century. He used fresh vegetables, fruits and medicines to do medical experiments on sailors who were suffering from scurvy. Once, when he was treating the sailors on the ship named "Navigation Number 5", he sorted out some sailors and divided them into six groups. He used different methods to treat them, such as different foods, medicines and treatment methods etc. What surprised him was that, the illness of the sailors who took medicines did not improve at all; on the contrary, the group who had lemons recovered in a short period of time, as if they had taken some catholicons. Forty years after, the British Navy adopted his method and stipulated that, during the time on the seas, each soldier must have some water steamed with lemon leaves each day. Two years later, scurvy distinguished completely in the British Navy. Until today, the British people still address their sailors or their bluejackets "lemon people". Why can lemon treat the scurvy? It is natural for us to think that lemon must have some necessary substances to support life, i.e. vitamins. In the early 20th century, the people thought that scurvy was a kind of symptom caused by the shortage of vitamins in the human bodies. By the 1930s, the scientists finally separated "ketohexose" from cabbages and lemon juice, comprehended its chemical structures, and recognized that it was an important element of Vitamin C. Therefore, the people then called lemon a mysterious medicinal fruit. Lemon trees are evergreen and small arbor trees. They originate in Malaysia; but we can also find them in the coastal areas of the Mediterranean, Southeast Asia, and America etc. In China, Taiwan, Fujian, Canton, and Guangxi also plant lemon trees. 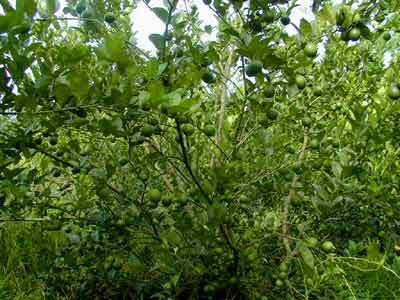 The young lemon leaves and flowers are all purple; lemon fruits are oblate, and are as big as eggs. Lemon fruits are light yellow in color, and are coarse looking from the appearances. The skin of the fruit is thick and fragrant in smell. Lemon juice is a bit sour, which can be concocted into drinks or made into spices. America and Italy are famous lemon producing countries, and France is the country that consumes the most lemon in the world. Lemon is one of the fruits that have the most multiplied medical uses. It is rich in vitamin C, citric acid, malic acid, socium and kalium contents, which are all quite beneficial for human health. Vitamin C can maintain the regeneration of various tissues, cell cytoplasm, and can ensure their biological properties in human bodies. When Vitamin C is in shortage, the cell cytoplasm in the human body will also reduce; as a result, the cells will become crisp, lose their ability in resisting outside forces. People who are in shortage of Vitamin C are prone to catch scurvy because of their poor health. Scurvy in the early stage has symptoms such as bleeding under skin, halitosis, and loosening of teeth; in the later stage, it may cause the breaking of blood tubes in the human body and result in the death of the person who suffers from it. Nowadays, Vitamin C has more uses, such as for the prevention of cold, stimulating the process of blood-making, and resisting cancers etc. Lemon juice is a kind of tasty drink and the making of lemon juice is quite easy. For example, we can first squeeze the juice out directly; and then mix it with sugar, ice, or icy water; finally, the mixture becomes a drink. The pale sour and sweetness, as well as the faint fragrance of the juice make people refreshing. Lemon juice is popular to most of the people on the globe.